There are about seven individual ski centers in the Ushuaia area. Since each is quite small, the descriptions deviate from the normal format. The two alpine ski areas, Wolfgang Wallner and Glacier Martial, are located just north of and overlooking Ushuaia. Between the two is the Club Andino's nordic ski area called Francisco Jerman. Several kilometers northeast of the city are the cross-country ski centers of Tierra Mayor, Las Cotorras, Altos del Valle, Valle de Los Huskies, and Haruwen. I'm only covering Tierra Mayor in this review because it's the most established, has the best trails, and is centrally located near the others - all five are located in the same valley and a skier can visit all in a day. All these ski areas are serviced by Ushuaia, the southernmost city in the world. The ski season around Ushuaia generally lasts from late June to late September. An earlier storm will, however, start the season because short days and low temperatures prevent melting until spring. Destruction of the accumulated snowpack is instead performed by the high-velocity, ground-hugging winds that often roar down the valleys of the region. Storms normally approach from the southwest and will drop 10-15cm of very light, dry snow over their 2-3 day duration. Two alpine ski areas, each with one principal and one beginner lift, are located very close to Ushuaia. The CAU offers skiing at the northwest edge of the city on a run named Wolfgang Wallner in honor of one of the founding members of the Club. The other ski area, Glacier El Martial, is located above Wallner in the bottom of a narrow valley which leads to the Martial glacier. Wallner is clearly the locals' favorite place to ski. Martial has the only aerial lift on Tierra del Fuego. The Doppelmayr double chairlift begins at 380m (1,240ft) above sea level and ascends a deeply carved, but softly inclined valley to the top of the treeline. It lies right (east) of the brook that drains the circular basin above. The prevailing winds blow down the valley making the ride particularly bracing. There are two south-facing runs at Glacier Martial. The main run is 30 meters wide and cuts into the left (west) side of the valley. The run slopes gently with eroding banks on the right side and sudden drops into the forest on the left side. A second run could be described under the chairlift. This trail needs a great deal of snow to facilitate skiing and rates upper intermediate. Outstanding backcountry skiing could be enjoyed from the top of the lift, and it may be possible to enlist the assistance of a snowcat. Numerous extreme and avalanche-prone chutes and bowls come into full view after a short hike from the top. 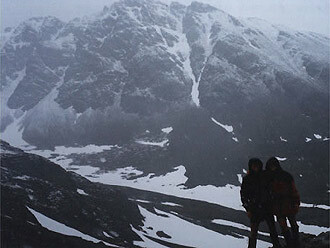 A ski adventure here would be a day-long ordeal and should be attempted only by the most experienced ski mountaineers. Prices in 1995 were US$10 or US$5 for a single ride up the chairlift. Ushuaia's other alpine ski area, Wolfgang Wallner, is the lowest ski area in South America and the southernmost ski area in the world. Starting from a base altitude of 140m (460ft), the detaching poma lift ascends the left (west) side of the trail. A second tow lift is located on the left side of the base of the poma and ascends to the third tower of the larger lift. The ski area is named in homage to CAU Member No 1 who served as Club President for 25 years until his death in 1970. The main run is rated upper intermediate to advanced. The south-facing trail is frequently mogulled, and the locals like to build jumps and ramps to add variety to the immaculate and consistent slope. The bordering forest is impenetrably thick except for a "variante" trail which is little more than a narrow road snaking through the trees. A lift ticket cost US$10 in 1995, and night skiing was available three nights-a-week. Ushuaia is, without question, the nordic skiing capital of the continent. Low elevations and cold temperatures combine to make the spot ideal for nordic training, and many international teams come to Ushuaia to train in the off-season. There are well over 100km of trails among the six developed ski centers. Jerman is the most wooded of all but is the only one that doesn't have trails that connect with the others. Tierra Mayor has the best developed trail system and is the most popular. Not discussed are Altos del Valle, Valle de Los Huskies, Las Cotorras and Haruwen all of which offer a lodge and interconnecting trails. Other possibilities for skiing in the region abound. The best is probably at Lapataia where the CAU maintains a small refugio. Nordic skiing has grown quite popular in the area in the last several years. The Club Andino hosts a 20km Marcha Blanca in mid-August in which everyone participates. A triathalon is also held annually with nordic skiing, mountain biking, and running events. The Lands End Race is an annual sled dog event held in late July. Tierra Mayor is the biggest of the five nordic centers with about 50km of trails set in a beautiful sprawling valley between the high peaks of the continent's terminus. The lodge sits on the southern edge of the massive Valle de Tierra Mayor which runs east-west and seems to be an old, shallow lake bed. Trails start at the lodge, cross the valley, and the weave in and out of the treeline below the barren peaks north of the valley. Use of the trails is free. Tierra Mayor is run by Gustavo Giró and his large family who all share in the duties of operation. Ana, the oldest daughter, directs the Ski School, while Gustavo, Alejandro, and María help where needed. Other activities at the resort include snowmobile rides on 340cc Lynx machines, dog-sled trips behind stocky huskies, and "wind skiing" in the spring. On a recent return trip from the Antarctic season (Antartida), their three snowcats were lost in the treacherous depths of the Drake Passage. There are four principle trails at Tierra Mayor. The Pista Valle/Bosque more or less circumnavigates a section of the valley, weaving in and out of the trees for 5km. Dique de Castores crosses the road to make a 6km loop southeast of the valley. A 13km loop located west of and then behind the lodge is used for training purposes. 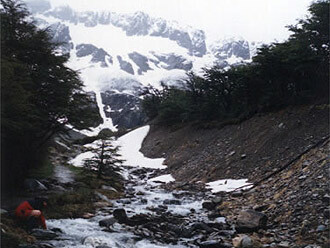 The last trail is the circuit to the small Refugio Cerro Bonete and the frozen Laguna Perdida (10km). The cozy refugio, 8km from the hostería, can sleep 12. Overnight arrangements can be made in the main lodge. The CAU opened this nordic ski area in 1980 on a broad ledge above its alpine run at 165m (541ft) above sea level. Named for Argentina's greatest cross-country skier who passed away before seeing its completion, the trail network at Francisco Jerman provides 15km of skiing on six well-marked routes with a total vertical change of about 50m (165ft). FIS homologated trails of 3km, 5km, and 7.5km are complemented by 1km, 2.5km, and 4km routes. The trails alternate through the forested glades and open clearings, and sturdy wooden bridges cross the countless brooks that flow through. All the trails are extremely well-signed with color codes keeping skiers on the correct route and skier silhouettes demonstrating the proper technique. The small refugio is located at the start of the trail network 5km (3 miles) from the center of Ushuaia (Tierra del Fuego) and 1km below the Glacier Martial alpine area.